1. PeachDish- I love meal kit services where you subscribe and all of the ingredients for a meal are sent to your home. PeachDish is an awesome service that sells nutritious and outside-of-the-box recipe ideas. I always have fun making these with my husband and enjoy the time cooking together. They have a new SuperFood series that is developed by a culinary director and a registered dietitian. 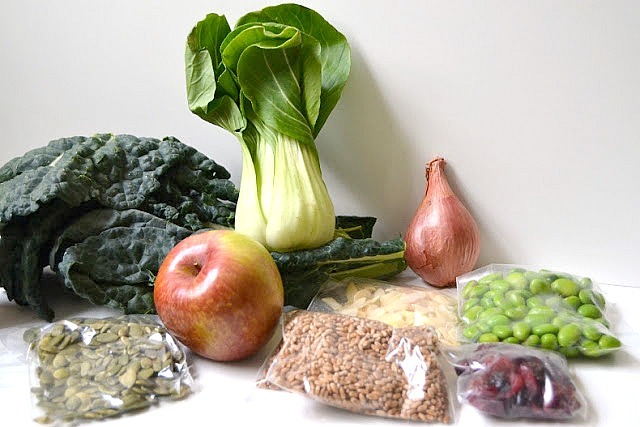 Ingredients that are included are wheatberries, pepitas, kale, cranberries, edamame and more. To try out, we were sent the ingredients for the Sautéed Chicken with Cauliflower, Arugula & Date Salad which turned out awesome. I cooked my cauliflower in the pan instead of roasting it and it turned out great. My husband even liked the dates which I was surprised about. The SuperFood salad was amazing! It had kale, bok choy, cranberries, almonds, pepitas and more all topped in a pomegranate juice dressing. I enjoyed it and the little bit of leftovers we had were even better the next day after the flavors had time to sit. I love that these meals are a complete meal and quite nutritious for you. I really enjoy PeachDish and would recommend it for those who want to try some different types of meals. 2. 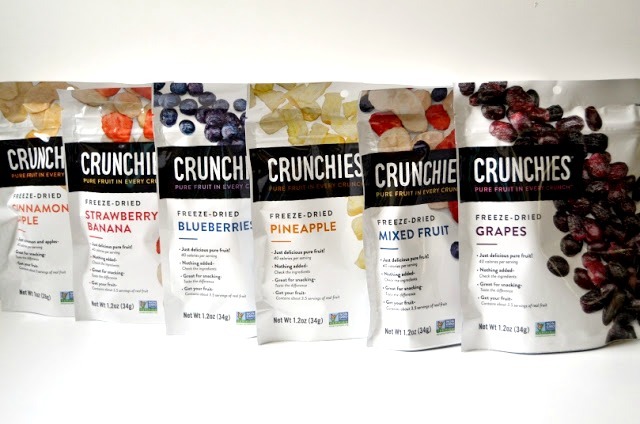 Crunchies Freeze-Dried Fruit- I thought that I was the biggest fan of fruit until my daughter started eating solids. She is even crazier about fruit than I am. I was sent these Crunchies Freeze-Dried fruit to try and I knew that Adalyn would love them. We opened up a bag of the raspberries and really enjoyed them! They are very fresh and make a great snack for kids. They also sell cinnamon apples, grapes, mixed fruit, pineapple, blueberries and strawberry bananas. 3. Chomps Snack Sticks- My husband is a big fan of meat sticks and beef jerky and was sent some of these Chomps Snack Sticks to try. They are made with 100% grass-fed beef. Unlike other snack stick brands, they are free of synthetic nitrates, nitrites and MSG. They are shelf stable for a year and their only preservative is celery juice. My husband really liked these and thought that they would make a perfect travel snack!